Figure 2-1. Phylogenetic tree of life (based on 16S rRNA sequences). 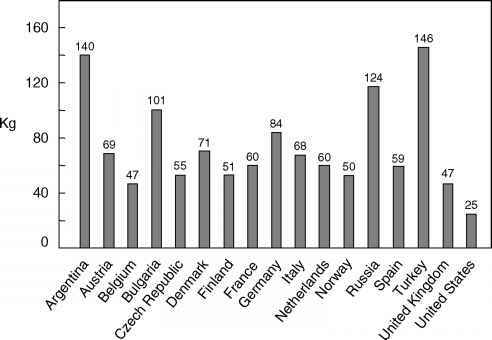 Courtesy of the Joint Genome Institute (U.S. Department of Energy). extreme environments (e.g., very high temperature, very low pH, very high salt), but rarely are they associated with foods. 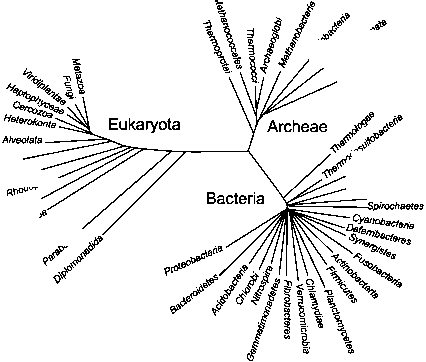 Classification of organisms as eukaryotic or prokaryotic is based on a variety of characteristics (Bergey's Manual lists more than 50 cytological, chemical, metabolic, molecular, and reproductive properties), but the traditional distinguishing feature is the presence of a nuclear membrane in eukaryotes. Included within the Eukarya domain are animals, plants, protists, and fungi.The latter are represented by the Kingdom Fungi, which includes both yeasts and molds.